UPDATE, 9/17: DNA results confirm the body of Catherine Rummerfield was placed in the wrong grave. On Thursday, Linda Schwanz, Rummerfield's daughter, contacted 41 Action News investigators and informed them the lab confirmed that her mother was buried in Debra Lemmon's grave. The ashes of Debra Lemmon were returned to the family Thursday. Joanita Long, Lemmon's sister-in-law, said Lemmon's urn was pulled from a vault at the Missouri Veteran's Cemetery in Springfield, Mo. Lemmon's urn was placed alongside Celia Atchison's husband's urn. Lisa Cox, Springfield police spokeswoman, said the department hasn't received confirmation on that testing. Cox also said they cannot say whether any criminal activity has taken place until they do. Two families stood under an old maple tree in the Hickory Grove Cemetery near Springfield, Mo., watching as a casket was pulled from the ground Thursday, Sept. 10. The casket was exhumed from the grave of Debra Lemmon, who died in July 2014. “Somebody needs to be held accountable,” said Jack Lemmon, Debra Lemmon’s husband. It all began in June, when the 41 Action News investigators were contacted by a former employee of Springfield Mortuary. 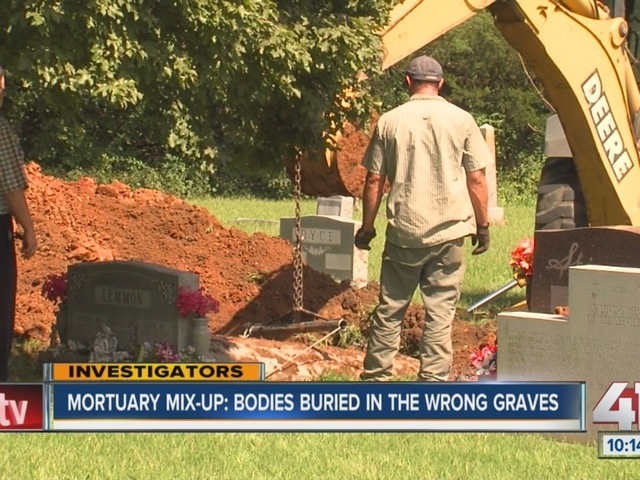 The former employee said that not only was there a mix-up at the business, but also a cover-up that led to the improper burial of three bodies. The whistle-blower, who doesn’t want to be identified, said the apparent mix-up happened on July 29, 2014. The former employee said Randy Barnes, owner of Barnes Family Funeral Home, in Ozark, Mo., came for the body of Catherine Rummerfield, but he couldn’t find her. During that time, the former mortuary employee said it became apparent that Barnes Family Funeral Home had another body at the mortuary, that of Celia Atchison. The whistle-blower told 41 Action News investigators that Brian Simmons, the owner of Springfield Mortuary, and Barnes decided to compare a picture of Rummerfield to the body labeled as Atchison. “The decision was made that we had mislabeled bodies and Celia Atchison was taken to Catherine Rummerfield’s grave for direct burial,” the former employee said. Still, she said her boss knew he sent out the wrong body. That’s when the whistle-blower said everyone at the mortuary began frantically looking for Rummerfield. “We start unzipping body bags, checking toe tags, and going from there,” she said. Next, she said they began reviewing surveillance video where they discovered someone from another funeral home had helped themselves to the mortuary’s cooler. The whistle-blower said it was a worker with Brumback Funeral Home, located in Stockton, Mo., who had come for the body of Debra Lemmon. The former mortuary employee said that after a thorough search, they found Lemmon’s body. This meant Rummerfield was taken by Brumback Funeral Home by mistake. On Thursday, Sept. 17, DNA results confirmed Rummerfield was buried in Lemmon's grave. Atchison, who had been sent out as Rummerfield (according to the whistle-blower) was supposed to be cremated. The former mortuary worker said after realizing mistakes were made, she told 41 Action News investigators that her boss came to her and two other employees with a shocking request. “He had instructed us to cremate Debra Lemmon with Celia Atchison’s paperwork,” the whistle-blower said. The request, she said, came attached to a bribe. The former mortuary employee admits to cremating Lemmon as Atchison. She said she did it out of fear that she would lose her job. 41 Action News investigators called Barnes Family Funeral Home and Springfield Mortuary. While both Simmons and Barnes were reached, neither one of them wanted to comment on the matter. A call was also placed to Brumback Funeral Home, and it was not returned. While checking into the whistle-blower’s claims, the 41 Action News investigators pulled the obituaries for all three women. We found that they all died within two days of each other, which means they could have easily been at the mortuary at the same time. Rummerfield's family contacted 41 Action News and said the DNA results confirm Rummerfield was buried in Lemmon's grave. Catherine Rummerfield was buried in Debra Lemmon’s grave at the Hickory Grove Cemetery. Debra Lemmon (who was cremated) was buried in Celia Atchison’s grave next to Atchison’s husband in the Missouri Veteran’s Cemetery at Springfield. Celia Atchison was buried in Catherine Rummerfield’s grave at Rivermounte Memorial Gardens in Springfield. The whistle-blower said she filed a complaint with the State Board of Embalmers and Funeral Directors in February. However, when contacted, the board said they couldn’t comment on the matter. In August, 41 Action News investigators placed a call into the Springfield Police Department and to Rummerfield’s family. Linda Schwanz, Rummerfield’s daughter, said she visits her mother’s grave often and never imagined someone else could be the one buried there. Schwanz then contacted Springfield police herself. Then suddenly, Schwanz said she got a phone call from Barnes. She said he told her he had doubts that her mother was buried where she was supposed to be and offered to make it right by paying for the exhumation and DNA testing. Barnes Family Funeral Home made plans to exhume the casket from Lemmon’s grave first. It was scheduled for Thursday, Sept. 10. 41 Action News investigators met with Joanita Long, Lemmon’s sister-in-law, prior to the exhumation at the Hickory Grove Cemetery. She said learning that her sister-in-law may not be where they buried her was like being part of a movie. “It’s not anything that would ever happen to us,” Long said. While Simmons remained quiet in the weeks leading up to the exhumation, Long said she received a call from him on the day before. “He said that he was afraid that he had cremated Debra by mistake,” Long said. The word, “mistake,” didn’t sit well with Long. She said what happened was intentional. Lemmon’s husband, Jack Lemmon, said if what the whistle-blower said is true then his wife’s dying wish was ignored. “She was against cremation, you know, 100 percent,” Lemmon said. On the day of the exhumation, both Barnes and Simmons were present. Again, neither one of them wanted to comment for this story. Detectives with Springfield police took pictures at the scene as the Lemmons and Linda Schwanz stood nearby. Schwanz did not want to wait on the DNA for confirmation so her granddaughter offered to identify the body. Rummerfield, Schwanz said, had some rather identifiable characteristics. She said her mother had a mastectomy and one toe that overlapped another. As Schwanz’s granddaughter approached Lemmon’s casket, she shook her head yes and said, “That’s her,” referring to her great-grandmother, Rummerfield. Schwanz began to cry and was immediately comforted by the Lemmon family. “It’s like we're back to square one burying them again, going through the process of grieving,” Long said. The next day, an exhumation took place at Rummerfield’s grave. Schwanz didn’t mince words when it comes to those allegedly involved in the mix-up. Schwanz told 41 Action News investigators the lab confirmed that Rummerfield's body was buried in Lemmon's grave with DNA testing. As to what charges those involved could face, Springfield police said they could not give any details until the investigation is complete.